The city of Gig Harbor is somewhat of an anomaly: It has a small, beach-town feel, but it’s only a hop-skip (and beautiful drive) away from the heart of downtown Tacoma. While the enchanting city of Gig Harbor itself has enough to see, do, eat and drink to last an entire weekend, this drive will introduce you to the natural beauty and rural wonder of the area around the city. After you’re done with the scenic drive, you might just find yourself stopping to stay the night in Gig Harbor before heading home the next day. It’s certainly worth the time. During any season and in all weather, Point Defiance Park is worth a stop. But since this drive will take you to Gig Harbor, this is your chance to view that city from the other side of the water. Make a stop at the designated viewpoints for the Tacoma Narrows Bridge and Gig Harbor along Five-Mile Drive, and snap some pictures because that’s the bridge you’re going to cross, and the city you’re going to love. From Point Defiance Park, use Vassault Street, North Narrows Drive and North Jackson Avenue to take you south to Highway 16 West, where you’ll prepare to cross the Tacoma Narrows Bridge. The original Tacoma Narrows Bridge got its nickname of Galloping Gertie from the vibrations and flexing the bridge endured in high winds, which led to its famous collapse just months after being built in 1940. The replaced span, dubbed Sturdy Gertie, is beautiful to see and breathtaking to drive as it connects the city of Tacoma to the Kitsap Peninsula. There is a one-way toll of $6, which you’ll pay coming the other direction. 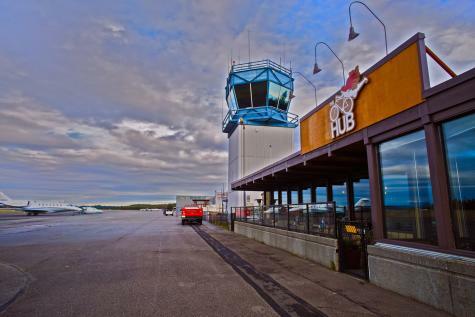 Immediately after crossing the bridge, the Tacoma Narrows Airport is a local airfield where you can watch small aircraft take off and land just yards away while enjoying a local craft beer at The Hub Gig Harbor. Otherwise, continue to Highway 16 to Exit 10 for Olympic Drive NW, which will take you to Soundview Drive and the scenic way into the city of Gig Harbor. Heritage Distilling Company – The most decorated craft distiller in the country for three years running, Heritage is famous for its naturally flavored vodkas and brown-sugar bourbon. You can tour their distillery just off Highway 16, or visit the tasting room along the waterfront. Harbor History Museum – This small museum is packed with interesting exhibits, including boatbuilding, maritime history and the roundest rocks in the world. Tides Tavern – Named among the best seafood dives of all time by Coastal Living Magazine, Tides Tavern lives up to its name. Harbor General Store – This store features aisles upon aisles of Gig Harbor-made goods and some of the best sandwiches in the region. As you leave town on peacefully winding Burnham Dr. NW, you’ll briefly rejoin Highway 16 before taking the exit for WA-302 West to Purdy. WA-302 will treat you to some gorgeous views as you cross the bridge to the Key Peninsula. Enjoy some more quiet wooded rural highway roads along WA-302 until you reach Cornwall Road Kp North. Here, we recommend a stop and a short visit at Penrose Point State Park, a 165-acre marine and camping park on the shores of Puget Sound. Then continue to the end of this scenic drive along WA-302 until you see signs for Joemma Beach State Park. Joemma Beach has more than 3,000 feet of waterfront on the scenic Key Peninsula, and is a great place to stretch your legs, or enjoy that to-go sandwich you picked up at the Harbor General Store.